OXFORD, Miss. 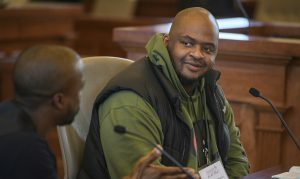 – When Kiese Laymon began working on his memoir “Heavy: An American Memoir,” he was writing to an audience of one. Laymon never expected that, just five months after the book’s release, “Heavy” would garner international acclaim and be honored with several of the highest awards in literature, including the Andrew Carnegie Medal for Excellence in Nonfiction. Laymon, who serves as the Ottilie Schillig Professor in English and Creative Writing at the University of Mississippi, has seen his memoir recognized as a top book by multiple outlets, including The New York Times, NPR, The Washington Post, Publishers Weekly and many more. The praise “Heavy” has received, outside that of his family and his hometown, has surprised Laymon. “I was really writing it to the place and people that raised me,” he explained. “It’s been shocking to see other people feel so much because of the book. I’ve been traveling a lot, and everywhere, from the East Coast to California, people seem to be thanking me for saying stuff that sometimes they wanted to say and couldn’t say. Laymon’s book describes, often with brutal honesty, the successes, failures, happiness and sadness of growing up as an overweight, black child in Jackson and the adult that upbringing eventually created. “In his artfully crafted and boldly revealing memoir … Laymon recalls the traumas of his Mississippi youth; the depthless hunger that elevated his weight; his obsessive, corrective regime of diet and exercise; his gambling, teaching, activism, and trust in the power of writing,” said the American Library Association, the organization that has presented the Andrew Carnegie Medal since its inception in 2012. “‘Heavy’ is one of the most honest and intense books I’ve ever read,” said Ivo Kamps, UM English department chair. “When we tell stories about ourselves, there’s always a tendency to edit our experiences and shape events in ways that have an audience in mind. We probably want to see ourselves as smarter, kinder or more heroic than we really are. Laymon grew up in Jackson, raised by his mother, who instilled a love of reading, writing and learning. He began writing at a young age and his mother enforced the importance of revision. “Revise, revise, revise” is a refrain in “Heavy,” and Laymon said that mentality applies not only to his writing but to the way his mother taught him to live life. “Revise, revise, revise,” Laymon tells his Ole Miss students. “Commit to revising every part of your life, every part of your profession, every part of your relationships. Education played a major role in his upbringing, and “Heavy” pays a lot of attention to his academic successes and failures. Laymon’s mother taught for many years at Jackson State University, and his love of learning pushed him toward the profession. “I love learning, and I do my best learning through teaching,” he said. “I love watching people take one idea and revise it and have that idea come out a million times better. I like the educational process. I like being a part of it, but I also like watching it happen. He received his education from Millsaps College, Jackson State University and Oberlin College. He earned an Master of Fine Arts in fiction from the University of Indiana and published his first two books, “Long Division” and “How to Slowly Kill Yourself and Others in America,” in 2013. Laymon had teaching stints at the University of Iowa and Vassar College before being offered the John and Renee Grisham Visiting Writer Fellowship to teach at Ole Miss in 2015. “He accepted our invitation and became an immediate hit with our students, as well as the faculty,” Kamps said. “We already knew he was a great writer willing to tackle important and difficult issues, but we quickly learned that he is also a committed educator. The fellowship turned into an offer to serve as the university’s Ottilie Schillig Professor, which Laymon accepted, saying he wanted to come home with a mission of lifting up the place he loves. “The main reason I came to Ole Miss was I needed to be back in Mississippi,” Laymon said. “I needed to breathe the Mississippi air and I needed to be close to Mississippi kids. “I love Mississippi with everything I have. I just want us to be better. I’m trying to do my part to help myself be better, but I also want to help our state be better, and I think part of that is acknowledging how wonderful and incredible we have been. He is using his growing platform to raise awareness and aid children in Mississippi. 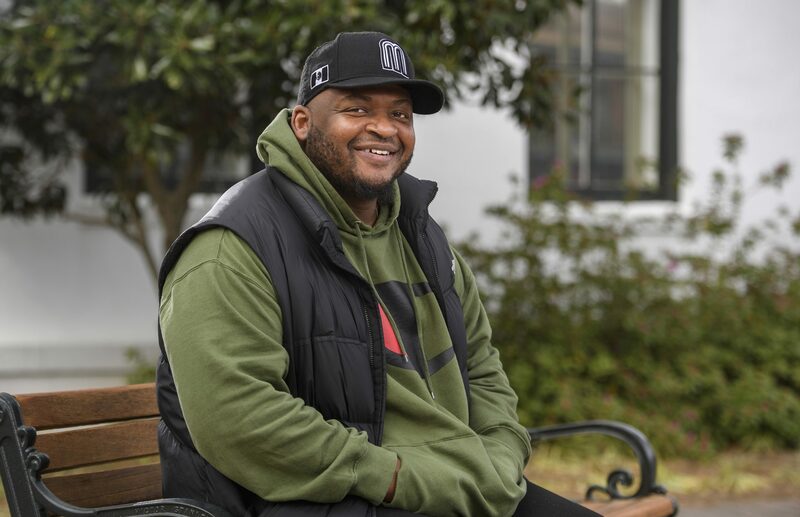 Laymon donated the $5,000 prize he received for the Andrew Carnegie Medal to youth organizations in the state that help educate and assist underserved youth populations. Laymon immediately made his mark on campus as well, Kamps said. “Kiese has many assets in the classroom – his life experience, his talents as a writer, his keen insights into our society with its persistent racial and gender inequalities – but I think that his ability to connect with his students as a compassionate human being is decisive in establishing a rapport with them and in inspiring them to become writers who can have a positive influence on their world,” Kamps said. 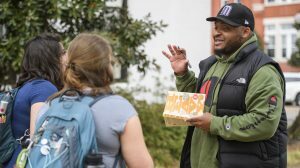 Laymon’s success has not changed the way he’s treated on campus, he said. He sometimes gets congratulations from students and has seen an uptick in requests for letters of recommendation. But his colleagues in the Department of English, many accomplished authors themselves, help keep him focused and grounded. “My colleagues are beyond a blessing,” he said. “They push me intellectually. They push me artfully. They are just really loving people. It’s hard to find competent, really loving people. Laymon divides time between teaching and traveling to promote his book and collect awards. His most recent, the 2018 Christopher Isherwood Prize for Autobiographical Prose from the Los Angeles Times, will be presented at the LA Times Festival of Books in April. But most importantly for him, “Heavy” received the approval of its prime target. “When my mother saw the final product, she was shocked,” Laymon said. “Part of her was sad, but she was also really happy. She created a writer. She created a reader. So, part of her was happy in terms of seeing the art of reading and writing and her investment paying off in this way. Laymon is also writing prolifically. He just finished writing for a television show, he’s working as a consultant on a film adaptation of “Heavy” and is in the process of writing a new novel. Although he remains on the periphery with the film, Laymon says it’s not out of the question that he makes his big-screen debut, albeit not playing himself. “I don’t even care (who plays me),” he said. “I’m trying to be as hands-off as possible. That book was so hard to write; I don’t want to write a screenplay. I’m going to be a consultant. Laymon also looks forward to shifting his focus back to his students, he said. “It’s harder to teach when you have all these other things pulling on you, but there is part of me that looks forward to getting done with some of this stuff, so I can get back to focusing on teaching,” he said.